In our current era, doing confinement by yourself is getting more and more commonplace. The lack of family support, hassle of hiring help/confinement lady, preference of not living with strangers in the house are just some of the more common reasons driving the uptake of DIY Confinement. Lucky for many, there are a lot of companies who have moved with the times and are now providing services to cater to this upcoming trend. I thought I’ll share some tips on how you can DIY your own post-natal confinement with ease. This easily eliminates any need to know how to cook or what to cook during confinement. Just like tip 2 below! If you don’t mind cooking your own soup, there are places where they pack the herbs for you and all you have to do is follow the instructions to add meat and put it all into the slow cooker. Go to your trusted medical hall, or go to establishments who specialise in this like Mammamia or most medical halls do actually pack these herbs for you but be sure to go to a established/trusted one. If you have a helper at home already, done deal! You can move on to the next tip. Otherwise, do look for part time help where they come for a few hours every now and help clean the house. It’s worth the money. I used to do that when it was just the husband and I living alone. It costed me about $60 for 3-4 hours. Read also: 10 important interview questions to ask your potential maid. DIY Confinement #4: Have Your Groceries Delivered! Go online and buy your groceries! There are heaps of such delivery service around like Honestbee, Redmart*, NTUC, and even Sheng Siong! *Make sure to save even more by ordering through Shopback. Huiji Waist Tonic, DOM, Yomeishu, all of these are great for the post-natal mummy. You can just drink it as it is or use it to amplify your dishes. 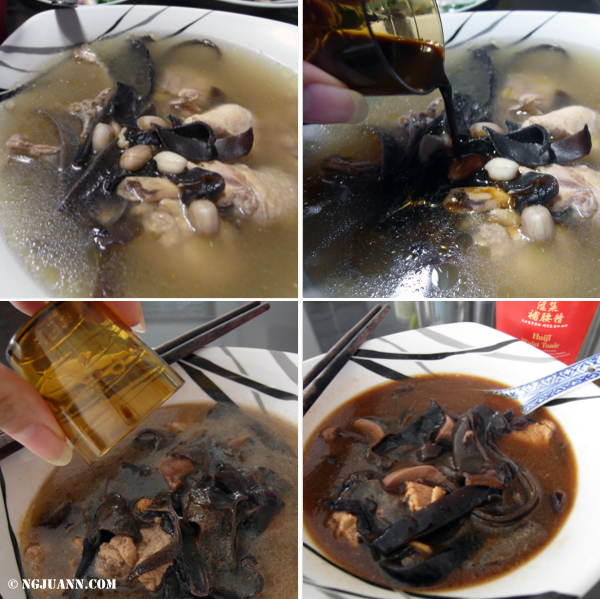 I personally prefer Huiji and this is how I used it to amplify my chicken, peanut and black fungus stew. Huiji is my personal preference over the other alternatives because it’s 100% vegetarian and doesn’t contain any alcohol which means NO disruption to breastfeeding!! I also drink it on it’s own! Next Post My Toddler Loves These Snacks! Great tips. I hired a confinement nanny for my first baby; used prepacked herbs from Mammamia and hired a full time helper for the second baby and am now considering getting tingkat confinement food. Do you know if Thomson Medical Centre’s food delivery service supply meals according to your confinement stages? Or are you getting the same dishes as all other mothers? I agree :) we are lucky to have moms to do our confinement for us! I really loved reading your thoughts; obviously you know what you are talking about! your site is so easy to use too. Thanks for the informative post.